Oh, glorious Friday the 13th. It is 1800 here, 6 PM Atlantic Standard Time and 5 PM Eastern Standard time. The sun is setting behind Union Island and the sky has gone from flamingo pink with little patches of aquamarine blue to a beautiful red. The temperature is 82 degrees and the winds are just starting to dip below 20 knots for the first time in days. The moon is rising in the east and although it is still cloudy, the moon is in full view right now. It is either full or almost full. Our GPS told us that tonight is the full moon, but today when I was in town I downloaded a 2006 moon phases calendar, and it tells me tomorrow morning, January 14, at 0948 GMT is the official time of full moon. Whichever, it is beautiful. I’m hoping for clear skies tomorrow night as we head across the Caribbean Basin to Bonaire under the light of the moon. I know I can’t have everything, but that would be nice. We just got the dinghy and motor onboard in preparation for departure tomorrow. We are SO glad we made the decision not to leave this morning. It was an ugly, ugly day—rained ALL night which is unusual and drizzled all day under a totally overcast sky. The anchorage here is full of boats waiting to depart, and as we listen to the weather reports, we realize that boats all throughout the Caribbean have been waiting for the window. It is tomorrow. So we will depart here at sunrise and hope to reach Bonaire by Tuesday. We used today to try and make arrangements for our Galapagos visit. Yesterday we sent a FedEx with what we thought were the required documents to secure a cruising permit there. It cost $30 US to send the FedEx, but then we received an e-mail last night explaining that we needed to send additional documents via fax and wire money to cover the cost of the autografo (6 week cruising permit). We paid today for our lack of preparation. We were both so busy working right up until the day we left, that we didn’t make arrangements like this from the US. That would have been so much easier. Live and learn. We had to wire some money to the Naugala Agency in the Galapagos and that took nearly all day. We had their bank account information, but when we went to the Western Union office we learned that they can’t wire money to a bank account without some sort of special code. Naugala wasn’t in their data base. We tried a MoneyGram—same story. We tried the bank (Friday is payday and we stood in line forever), but they can only wire money if you have an account and you have to have a local address in order to get an account. We were told we would need to send the money directly to a person, so we needed to call our agent, Johnny Romero, in the Galapagos. That meant leaving town and coming back to the boat in what felt like gale force winds in order to make a call on our satellite phone. But then we didn’t know how to call the Galapagos. We have cruising guides for the Caribbean that give the country codes and detailed directions for making calls, but we have nothing like that for the Galapagos and all of our e-mails from Naugala just had a ++ at the beginning. We now know that means 00, but it took calls to the Galapagos and to the Naugala agent in Florida to figure this out. And then there was the simple fax we were supposed to send—copies of our passports. Not so simple. Passports don’t copy well on the old copy machines here and, of course, we had not scanned our passport information into our computer before leaving. We had our passports with us when we were in town early in the day, but when we returned to send the fax and wire the money, we had left the originals on the boat and had only the copies with us. They were too light to go through the fax machine (or so we were told after many attempts), so we had another huge hassle having those scanned in and sending them as e-mail attachments. The moral of the story is to be prepared. If you are going to do something like this, have all of your major documents scanned into your computer before leaving and buy all of the travel guides you will need in the US. I hope we got the information needed to the Galapagos today to start the cruising permit process, but we won’t know until we hear back from Johnny. Since we won’t be in a port until next Wednesday, we won’t be able to do anything about it until then. We wasted an entire day figuring all of this out, but now at least we know what to do next time. It is time for me to fix dinner. We bought some of the locally grown okra tonight and I can’t wait to eat it. I fix it the same way that I do fried green tomatoes—dip the cut okra in whole wheat flour with salt, pepper, and garlic powder. Dip the coated okra in an egg batter, and then into corn meal and fry. I love it! We’ll also have a salad of the locally grown lettuce. It is a cross between leaf lettuce and Romaine. It is so good. The tomatoes are tiny and not so good, but you can’t have everything. And I am out of Paul Newman’s Balsamic Vinaigrette dressing—the only dressing we like. I intentionally did not buy salad dressing thinking I would have all of the time in the world to make my own, but somehow that isn’t the case. Add to that the fact that I seem to have only one bottle of balsamic vinegar. Oh well, I guess I’ll figure this one out, too. By the way, I noticed this evening that our red and white stripes on Old Glory are starting to bleed and the white stripes are turning pink. I guess we are going to have to rewrite the lyrics to some patriotic songs—the red, pink, and blue. I know. I’m beginning to sound like a broken record. Yesterday’s log title was “Change in Plans” and today’s is the same. That’s because we’ve had another change in plans. Last night, squall after squall came through here and the morning was totally overcast with heavy clouds hanging over Carriacou, the next island in the chain. It did not look like the morning to leave on our passage to Bonaire. We listened to the morning weather and decided that we will sit tight until Saturday morning. It sounds like Saturday, Sunday, and Monday should all be good traveling days, and that should give us the time needed to get to Bonaire. When we checked in with Herb again this afternoon, it sounded like he agrees that we will be fine if we leave on Saturday morning, so that is what we will do unless the weather decides to change again. We’re starting to get a little stir crazy from sitting in the same place so long, but we should survive one more day. 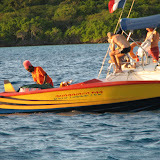 Our friends Gary and Barbara on Spectre were going to head to Bequia today, but they didn’t leave either. The harbor is filling up with boats trying to get out of the weather, but starting tomorrow people should be able to get on their way. I refuse to leave tomorrow as it is Friday the 13th AND a full moon. Mark thinks I’m way too superstitious, and that might be, but I’ll feel much better waiting until Saturday morning. I did laundry today. I know that in Bonaire there is a facility where I can wash and dry clothes or have them do it for me, but I have gotten used to doing laundry a little bit at a time. I’ll do towels and sheets in Bonaire, but everything else is really easy to keep up with. In this weather, things dry quickly and I have a hand wringer that does a great job of getting most of the water out of the clothes. We went into town a couple of times today. The first time we went in to Fed Ex information to our agent in the Galapagos. His name is Johnny Romero with the Naugala Agency and he is acquiring a cruising permit for us that will allow us to anchor in the 4 inhabited ports in the Galapagos Islands for the 4-6 weeks that we are there. Without the permit, you can only come into one port and stay in that one place. The second time we went in to stock up on beverages. It is supposed to be cheaper here than in Bonaire. Tomorrow morning we will go in to Customs and Immigration to check out of the Grenadines and get any fresh veggies we can find. We will probably head out of this harbor mid-day and go around the corner to different anchorage for tomorrow night. At first light on Saturday morning, we hope to start our trek to Bonaire. Let’s hope tomorrow’s night log does not have the same title as today! It is time to move on. I had such a good time on Happy Island yesterday that I’m afraid the log didn’t get written. So I’ll just combine yesterday and today into one log. The highlight of yesterday was our visit to Happy Island. We had invited Gary and Barbara Davis from Sprectre over for dinner and a pre-dinner trip to the island. This is a very tiny man-made island just out on the reef in front of us. It is not everyone that decides to build an island, but Janti did just that. He had a bar over in Ashton, but few tourists get over there. He also worked for tourism and was trying to clean up the town. One of the major problems was all of the conch shells the fishermen had left on the beach. 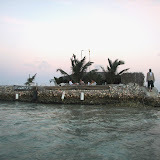 So he brought the conch shells here to Newlands Reef and built his island and opened his bar/restaurant. It is definitely an informal, barefoot kind of bar, but if you let Janti know ahead of time, he will prepare a dinner for you, or you can just go out to enjoy the setting sun with rum punch or beer. The cost per drink is $10.00 EC which is about $3.75 US, twice the price of anywhere else we’ve been in the Caribbean, but well worth it. Janti works hard to make sure you enjoy your visit to his island and it was a most enjoyable evening. He gets a 10 plus on my rating scale. I said in our log on Monday that we had listened to the weather from Herb and that he thought we might have a weather window for heading to Bonaire tomorrow. But then we heard other reports that made us think we should not leave until Saturday, so we were planning on that. Well, at 1600 this afternoon, we checked in with Herb and he said we should definitely leave tomorrow as the winds in Bonaire will increase on Sunday. So change in plans. When Herb says to go, it is time to go. The seas are still high, but he thinks this is our window. We will head to town to check out of here tomorrow morning and get on our way as soon as we can. We’ll first listen to Chris Parker’s weather at 0830, but unless he is in total conflict with Herb, we’ll be on our way. We should get to Bonaire sometime on Sunday, hopefully before the heavy winds get there. So it is back to “passage mentality”—up 3 hours, sleep 3 hours, eat on the run, and read lots. Since we will have a full moon on Friday (the 13th) it should be a beautiful time to be doing the overnights. I had said to many of you in e-mails that I would not be leaving here on Friday the 13th, but I guess leaving on Thursday the 12th is okay. Let’s hope so. We prepare to leave the Windward Islands that we have gotten to know and love with a bit of sadness and a bit of anticipation. We know we will return here someday, but leaving here feels like we are making the “big break”. It means we are no longer just playing around in the Caribbean to then head home. Not a bad thing to do, but not the intent of our trip. Heading west from here is the beginning of a very long trip even further west in order to get back here at some point. They say when you get through the Panama Canal you have probably come about 3,000 miles with only 36,000 left to go to get home. Oh, my! We will spend a week or so in the ABC’s—Bonaire, Curacao, and Aruba, and then head for the San Blas Islands in Panama when the weather is right. We will spend a couple of weeks in the San Blas and then on to Panama where we register and wait to go through the Panama Canal. We will play awhile on the western side of Panama and then make our way to the Galapagos. We will spend a month there, and then, South Pacific here we come! Stay tuned. Before I sign off, I want to thank my sister Patsy for sending me some news. Mark and I have been news junkies for most of our lives, but out here, we see no newspapers and hear or see no news. There is no National Public Radio on the high seas. Hopefully Patsy can keep us abreast of any major news events so we won’t be totally disconnected when we return from this trip. Thanks, Patsy. And I also want to say congratulations to my brother Dickie and his wife Conda. They sold their home in West Virginia that they have lived in for the past 35-40 years, and just yesterday, they bought a townhouse near North Myrtle Beach, South Carolina. They are beginning a brand new adventure in their lives and we wish them the best. Last night I wrote the log at 1830. Tonight it is 2030—different time, but we are still in the same place. Part of cruising is settling into ports and getting to know the place and the people. That is what we are doing here. The trade winds are blowing a good 20 to 25 knots, but the real reason we are not moving right now is the seas. They are building from 8 feet to 12 and even higher, so we have settled in until the seas settle down. We talked to Herb on Southbound II this afternoon and he thinks we might have a good window for heading to Bonaire on Thursday. We’ll wait and see. In the meantime, we take our daily walks to explore the island, continue our research on future ports, and visit with fellow cruisers. I know . . . tough life. We spent our morning finalizing a tentative schedule for our visit to the Galapagos Islands. One of the main reasons I signed on for this cruise across the Pacific was so that I would get to sail into the Galapagos just as Darwin did some 170 plus years ago, so planning for that part of the trip is very special to me. What I am realizing is that even though we did lots of prior research and planning, part of every day must be spent fine tuning the itinerary and researching more carefully the next ports of call. This is my specialty, so I am in my element doing this. We had lunch on the boat—salad with left over lobster. I totally forgot to mention our lobster experience from yesterday. As almost everyday, the local vendors come by offering water, fuel, and lobster. Yesterday we caved and bought a big, beautiful spiny lobster. Some day we will figure out how to capture our own, but for now, buying one was adventure enough. They are huge, so we had to figure out how to properly cook it. Figuring out how to eat it was not a problem, but I will attest to the fact that they are named properly. They are spiny. One lobster tail was more than plenty for the two of us for early Sunday dinner, so I packed the meat from the claws and legs and saved them for lunch today. The lobster dinner yesterday was fantastic and the left-over lobster was a great addition to our salad lunch today. This afternoon, we headed to town. All morning we had seen smoke coming from the airport runway area, so when we landed the dinghy and headed to the internet provider by the airport we began to ask people what was happening. No one knew how the fire started, but it was a grass fire adjacent to the runway and it had gotten out of control. It was raging when we arrived, but by the time we had gone to the internet provider and sent some e-mails, the fire was finally under control. The brand new fire truck, which had never been tested, did not work, but a hose that was connected to a water source at the adjacent Anchorage Yacht Club finally did the trick. It was a short but intense time in town with locals all stirred up by the fear of what a fire out of control in a dry environment and high winds can do. We then took another cross island walk. This time we walked along the northern coast visiting the Big Sands Hotel. As I have said before, one has to downsize their vision of “hotel”, but the location was great. We circled an inland mangrove swamp and walked by grassy hillsides which provide the grazing grounds for many of the island goats. We got back to the boat in time to listen to the afternoon weather from Southbound II and then headed over to Spectre. This is the 37-foot Tayana owned by Gary and Barbara Davis. We had met them aboard Windigo our first night here. We stopped by their boat to say hello yesterday and they invited us over to visit their boat this evening. They are sailing out of Trinidad, but their home port is Philadelphia. Gary worked as special agent for the US Drug Enforcement Administration (DEA) in Jamaica and Trinidad and ended up retiring in Trinidad and buying their current boat to cruise the Caribbean. We had a great evening getting to know each other and talking politics. We realized tonight that we have not heard a news report since we left Boston in October. Someone from New Hampshire Public Radio needs to send us a news synopsis. We are totally disconnected! What’s happening out there? It is sundown and we just got back from a walk to the next town of Ashton. We are sitting here in the cockpit facing the stern of the boat which is directly west. The sky gods decided on an understated color scheme this evening. The western horizon is painted with shades of dusky pink and yellows mixed with streaks of gray clouds and topped with shades of blue. Not as colorful as some evenings, but still beautiful. Ashton is about two miles from here. We walk through Clifton, up a hill, head down the hill and pass the elementary school with its playing fields right on the ocean, up another hill and past the Catholic church, down a hill and through a mangrove area where we saw lots of the dreaded Manchineel trees, and finally into Ashton. Manchineel trees are often found on beaches and are much like poison oak. Best to learn what they look and not to touch. These trees were all marked with bright red paint to help people notice them. Not much else to report today. We spent the morning doing some much needed boat cleaning—this time on the outside. We polished stainless and cleaned the aft topsides. We continue to work on our trip schedule from here to the Galapagos and will report on that once it is completed. This is a very different place than all of the other anchorages where we have been. Clifton is a very quiet town, almost no cars or vans compared to other stops, and almost no boat boys. It is dryer here and you can tell that life is slow and easy. We could actually walk in town without fear of being run down by a speeding mini-van. As in most of the Windwards, stores close at 1500 on Saturday and do not open again until Monday morning. So by the time we arrived and got to town, most things were closed. The sail here only took a couple of hours from Tobago Cays. You can easily see from one island to another, so nothing is very far away. We anchored next to a boat flying both an American and a Canadian flag, and on our way into town, we stopped to meet our neighbors. Jim and Jan Dumouchelle aboard Windigo. They have dual citizenship but live in Raleigh, North Carolina. They sailed south to Trinidad last season, went back to Raleigh for the summer, and are sailing back to St. Martin this season. There, Jim’s brother will help Jim take the boat back to North Carolina. Jan will fly back. They invited us to come back for a sundowner at 1700. They had also invited fellow cruisers Roger and Barbara who are sailing north in their Tayana 37. We enjoyed our evening with both couples. The weather is supposed to get very windy here until at least Wednesday. We will have to delay our sail to Bonaire until after that and will decide tomorrow whether we will stay in this harbor, move to a different Union Island harbor, or move on to Grenada for the next couple of days. You’ll have to check in tomorrow to find out what we decide. I keep trying to capture the unbelievably beautiful shades of green and blue water here, but I don’t think there is any way a camera can capture this with all kinds of special filters. I will keep posting my attempts, but you will just have to use your imagination to fill in the gaps.